I don’t claim to be a theologian by any merit, just a girl reading her Bible and sharing things that God has revealed. I hope it encourages you and blesses you. Since July, I’ve been doing this Discipleship Journal Book-At-A-Time Bible year plan on the Youversion Bible app. It usually alternates between an Old Testament book and a New Testament book. I would say possibly in Exodus and definitely in Numbers and Joshua, the Bible talks about God designating certain cities to become cities of refuge. If a person was to accidentally (with no malicious attempt) kill someone, this person could flee to this city to avoid being avenged by the victim’s relatives. If found truly not guilty of intended murder, that person would stay in that city, safe from harm, until the current High Priest died. But if the person left that city before his time had come, his safety was not guaranteed and the relatives could kill him. Like I said before, I read about the city of refuge a few times recently. At first I was like Cool story, bro. Safe cities and all. But today, I received a new interpretation of the city of refuge. Fast forward to modern day, God is our city of refuge. We sin, intentionally and unintentionally, but we as Christians have run to God as Our Protector. But like the person who has sought the safety of the city of refuge, we have to remain in that refuge to escape death or literally to live life without fear for our safety. In terms of our walk, we first ran to God when we first accepted Him as our Savior. To some extent, we all did it escape death but we also did it to live life. Just like the city of refuge represents life for the person, God represents Life for us. (I had to bold, capitalize that one. Because a Life with God is no ordinary life.) But like when the person’s safety becomes compromised as soon as he leaves the city of refuge, our safety as children of God gets compromised when we cease to interact with Him as we should, or leave the walls of His refuge. I thought that was cool little revelation, one I definitely needed to take heed to. Before I start I want to say HAPPY INDEPENDENCE DAY NIGERIA! Cheers to 52 years and many more in store. 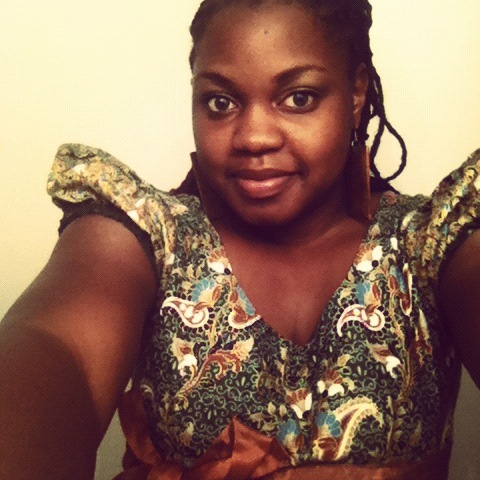 Today I wore a Nigerian top with blue jeans, a true sign of Nigerian-Americanness. 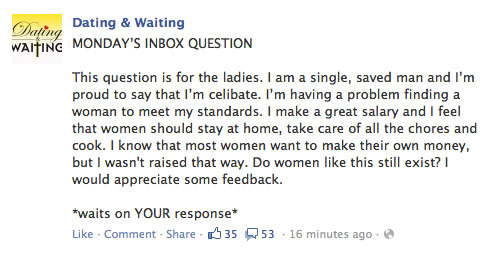 So while I was loafing on Facebook, I came across this post by Dating And Waiting (A fabulous and encouraging resource for single Christians). I can’t say that I was offended by this message but it was very clear that I am not the woman meant for this man. In the comments there actually girls that were like “Yes! This is exactly what I want” while I immediately became nauseated at the idea of being at home all day and being a slave to domestic expectations. Like I said, great for someone. Else. So that got me thinking about my paradoxical ideals when it comes to dating and my future marriage. Part of me enjoys the traditional views of marriage and dating. I believe in what the Bible has to say about submitting. I believe a man’s place is at the head of the family, spiritually, physically, and any other -ly that may entail. I believe dating initiative starts with the man. I want to be wooed. I want to do everything in my power to help my future husband be the best man he can be. I want to support him emotionally, spiritually, and any other -ly that may entail. All that good ol courtin your grandparents used to tell me about. Here’s where I tend to deviate. Just because I want you to be great doesn’t mean I want to lessen my greatness. You have a great job, great. But why can’t I work and do what makes me happy too? As a modern woman, there are a lot of things that might sound contradictory to that above section but seem to work seamlessly in my mind. I’m almost 25, I foresee that I’m going to have to do a lot of things by myself before I do it as a duo. It might seem like pessimism but I have to prepare myself to be able to do whatever needs to be done when it needs to be done without depending on a man. Of course, if a man is there, I’ll be happy to request his help but if not, I still need to be able to do it. (This, however doesn’t concern the practice of changing tires, I will always play damsel-in-distress on that one.) I’m not even sure if any of this is really making sense, nothing ever does outside of my head. As a modern woman, I want to bring a lot to our proverbial table. I want to be an equal in some senses, and a support in others. I’ll quote the great philosopher Ne-Yo. I’m a movement by myself, but we’re a force when we’re together. I’m good all by myself, but baby you make me better. That’s how I feel about me and how a positive relationship would be in my eyes. Quite the yardstrick huh? I just want to be great but part of awesome. Did that make sense? No? Oh sorry. But that’s great thing about God creating so many different types of people. So the right people will be with the right people and they can fulfill the vision or purpose God has for them. Ok. Off to go apply for pirate jobs do homework. I shudder at the pace that wrong information can be disseminated nowadays. Samsung pays Apple $1 Billion in 30 Trucks full of 5 Cent Coins is a Hoax : Fashion & style. Don't worry, I don't have a rich uncle with a massive inheritance and I won't ask for your bank account number.